Material for feathers: you can use the same color front and back or get two different colors of material. 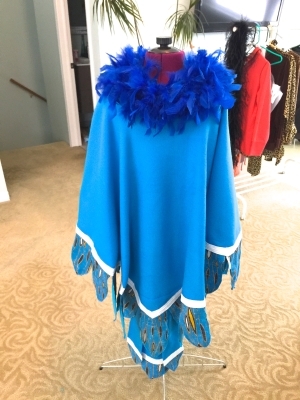 The number of feathers you need will depend on how large your poncho is. 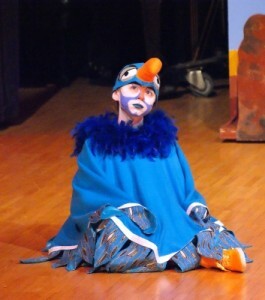 My costume used 32 feathers and 3 larger tail feathers. My feathers were 8″ long by 4″ wide and the two sides are serged together. The tail feathers were about twice the size of the regular feathers. 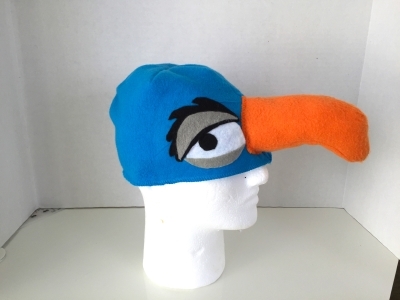 Zazu’s headpiece was made entirely out of material. I started by making a generic “skull cap” out of blue fleece, to fit my actor’s head (it’s about 22 inches around). I serged the bottom of the cap so that it wouldn’t roll up or under, and I sewed the top of the cap. 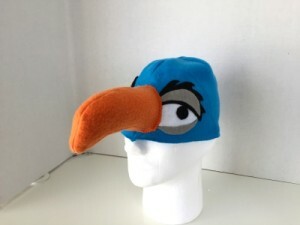 Next, I cut out a beak shape out of orange fleece, sewed it and stuffed it with ordinary polyester stuffing. 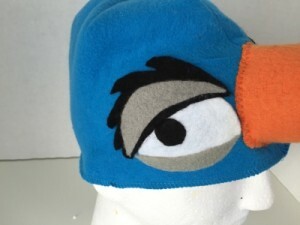 I centered it on the front of the cap and sewed it on. 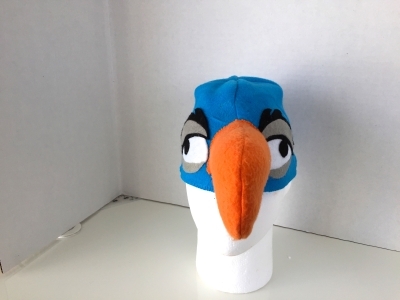 I then used white, gray and black felt to cut out the eyes and eyebrow shapes and I hot glued those onto the cap on each side of the beak. For Zazu’s costume, I cut out a large poncho, roughly in the shape of a square. 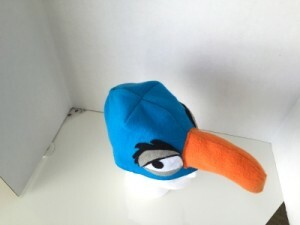 I found the center and cut out a small hole for the head. I surged the head hole. Next I cut out approximately 64 feather shapes out of two different contrasting materials; a front material that you’ll mostly see and a back side of the feather that you will only get glimpses of when he moves or flaps his wings. I surged the two sides of the feathers together (you could use a zig-zag stitch if you don’t have a serger). I also made 3 larger feathers for the tail. 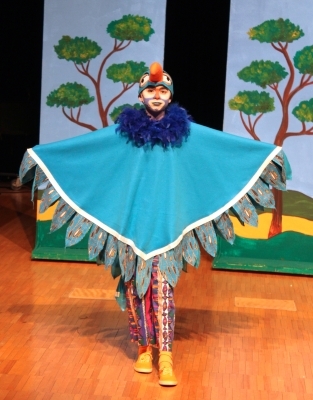 I sewed all the regular sized feathers around the poncho and sewed the 3 larger feathers in the back for the tail. I attached a small elastic “loop” on each side of the “wing” so that actor could put his fingers through the loops and have something to hold on to when he spread his wings. Lastly, I used plain white ribbon to trim around the edges of the poncho and the bottoms of the tail feathers. I used a darker blue feather boa for around the neck for extra flair! To complete the look, I made simple elastic waist pants out of some brightly colored African print material. 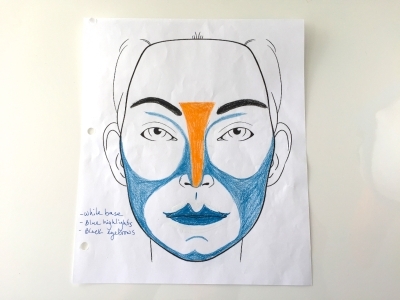 I had the actor wear bright orange socks and I dyed a pair of white canvas shoes orange. For his makeup, I basically did the same makeup that they used for the Broadway production, but also added an orange beak.